Ethernet cable management, also called network cable management, has been a necessary part for any structured cabling system. However, do you know why Ethernet cable management is needed and how many wire management ways can be exerted, and what their differences are? To know the answers, you can follow this post. Why Need Ethernet Cable Management? With a large number of input and output patch cords in racks or cabinets, the patch cord management can effectively provide a stable cabling system for applications of the data center. It can help to prevent unnecessary cable damages and dust, improve cooling and airflow, reduce signal interference and downtime, save space and cost, etc. In most cases, the solution to Ethernet cable managing relies on organizing devices, like patch panels and cable organizers. Customarily, based on how you use network cable organizing devices, the way to manage network cables can be divided into two types: horizontal cable management and vertical cable management. Surely, depending on specified network conditions and special needs, you are allowed to choose the matching type. Sometimes, it’s still possible for you to apply these two types together in cabling. 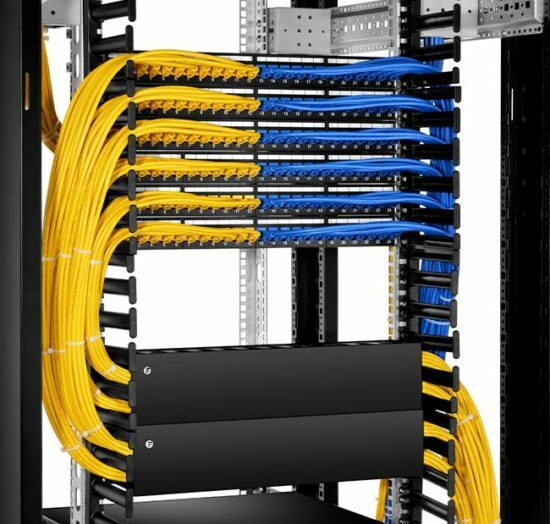 In Ethernet cabling, horizontal cable management is often applied as the 1U cable management. 1U, the acronym of one unit, stands for the height of the racks or cabinets, usually 1.75 inches. The size has been officially set as the standard vertically usable space for 1U. As its name shows, this type of management requires you to place proper managing devices on front racks or cabinets and manage Ethernet cables in a horizontal way. For the 1U horizontal cable managers, the plastic single sided horizontal cable manager with finger duct and the metal horizontal cable manager with five D-rings are the most popular types. 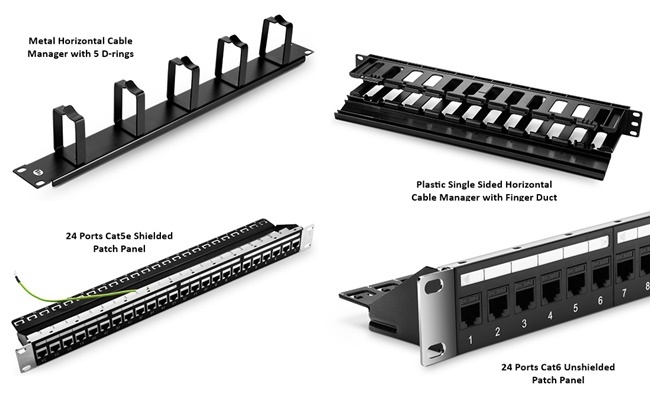 While considering Ethernet patch panels, Cat5e patch panels, Cat6 patch panels, and blank keystone patch panels are the commonly used types. Comparing with the horizontal type, the vertical cable management requires you to place organizing devices, usually the cable organizers, at both sides of the racks and secure them in a vertical way. For vertical cable managers, single D-ring vertical cable manager and 5U plastic vertical manger with bend radius finger are the top two types in the market. In networking cabling, no matter in your homes or office buildings, the Ethernet cable management has been an irreplaceable solution to deal with messy network cables. Choosing what kind of managing method, horizontal cable management, vertical cable management, or the combination of the two types totally depends on your needs. This entry was posted in Cable Management and tagged 1U cable management, ethernet cable management, horizontal cable management, vertical cable management on October 9, 2018 by Camilla.Zhang.